Want to add some tunes to a room without adding any clutter whatsoever? Installing speakers in your walls or ceiling is awesome if you’ve got a ton of cash to burn, but the RAYWAY LED Bluetooth Speaker Light Bulb is a much easier and cheaper way to go. It’s a tiny speaker so the sound quality isn’t going to blow you away, but it’s an awesome way to add streaming music to a bathroom, garage, or basement in a matter of seconds with no installation necessary. If you can screw in a light bulb, you can install this speaker — literally. Bluetooth Control — Built-in 3.0 speaker, it can be paired with Bluetooth-enabled devices. Wireless control range up to 10m / 33ft, you can enjoy the fun of wireless controlling the light and music playback. Smart Light Bulb — the bulb is not only a lighting single bulb, but also can be a speaker and led night light and led party light. Take control of your lighting from your Smartphone or Tablet. Support android 4.3, apple IOS6.0 version or up. Dimmable RGBW — High-performance RGB LED Color light source can make visual effect more prominent and light softer as you like to protect your eyes. 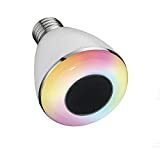 There are 16 colors changing with IR remote control. Music Speaker Bulb — Connect music on your Smartphone or to any sound or music with bluetooth speaker. Use remote controller can change the Mode to match music. This is great if you want to relax and unwind after a long day, make your kids bedtime an enjoyable experience, or help kick start your party. Easy Install with Remote — This magic light bulbs are made to the highest standards in the lighting industry. and it is simple to install and use with E26 base. Simple E26 screw in the bulb, And with a lifetime of 20,000 hours and comparable to a 30-60W incandescent bulb, you can save money while looking cool.